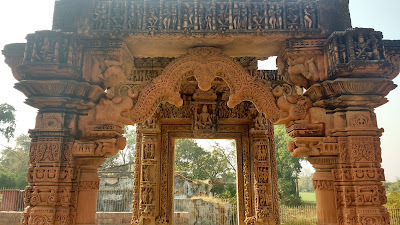 In the heartland of central Madhya Paradesh, lies a sleepy tehsil place called Gyaraspur. 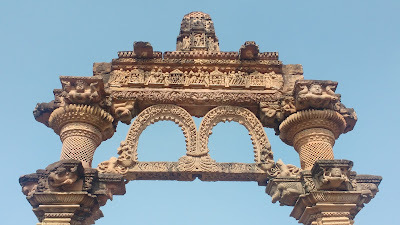 The small village surrounded by lush green fields is home to some striking monuments from the ninth and tenth centuries. 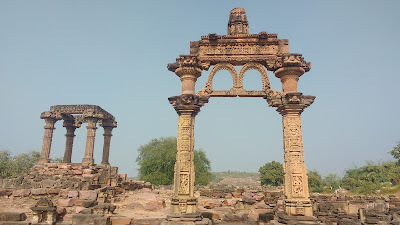 The monuments bear a mixed stamp of Shaivism and Jainism - indicating the homogeneity and evolution of culture in these parts. 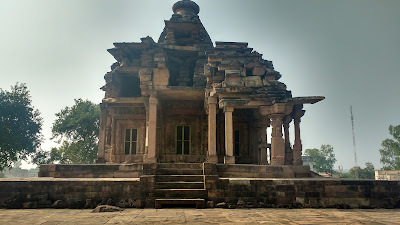 The monuments here are the Maladevi and Bajramath temples, the Hindola Toran and the Chaukhamba-Aathkhamba pillars. 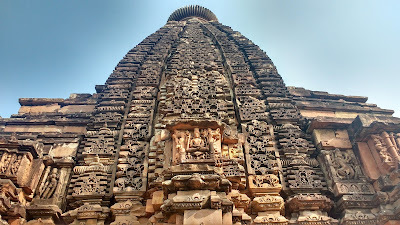 Gyaraspur was also the home of the iconic Shal Bhanjika - the tree-goddess, revered as the Indian Monalisa. 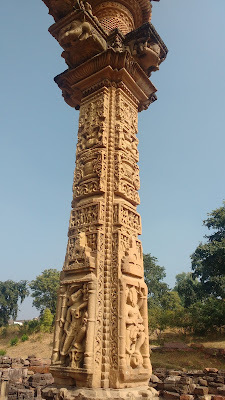 This is a group of eight pillars located next to the bus-stop. 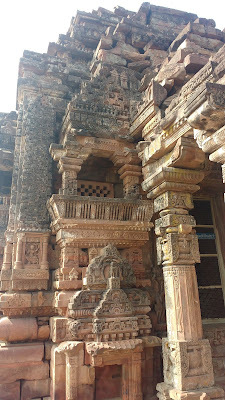 The pillars were a part of an ornate Shaiva temple leading to the main sanctum. 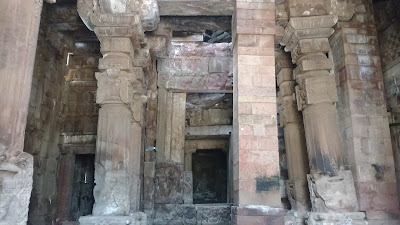 All other remains of the temple are destroyed and only the pillars remain. The pillars - contrary to expectation feature a high degree of artistic work and detailing. 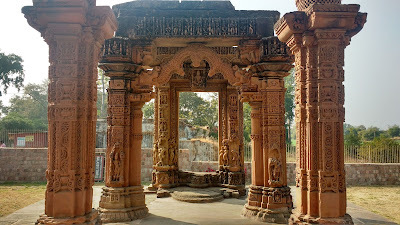 The entrance features detailed artwork depicting the dashavatars (ten forms) of Lord Vishnu, figurines depicting mythological scenes and ornamental patterns. 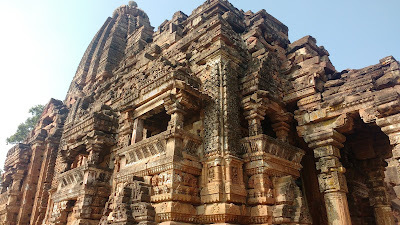 The four pillars of the main temple feature moderate artwork with mythological scenes and divine apsaras. 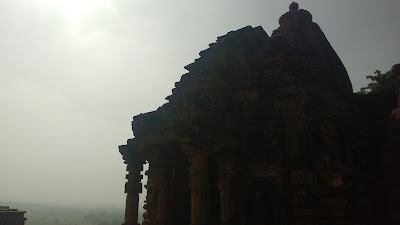 Further moving south across the hill, one comes to the magnificent temple of Maladevi. 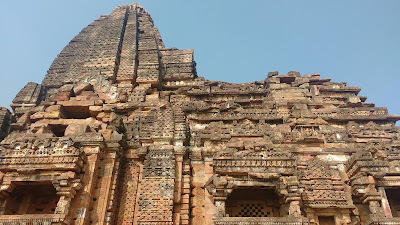 This temple dates to about ninth century. The temple is an architectural wonder in itself and has been built seamlessly on an outcrop of the hill. The higher ground of the temple lends it some beautiful views of the surrounding lush countryside. 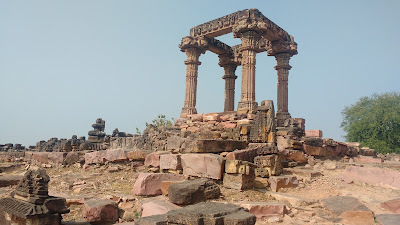 Over a period of time some portion of the hill has eroded into the temple and the main structure has considerably weakened. 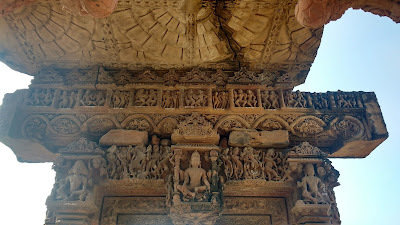 The original idols have been replaced by Jain idols as the religion began to spread its roots in the region. 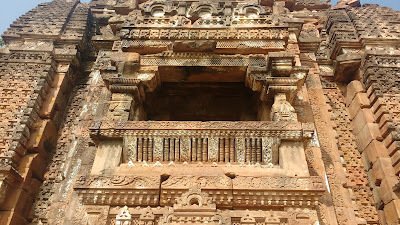 The temple has balconies at the higher levels which feature grill work in stone. These are delicate, yet rugged and are a wonder of craftsmanship. 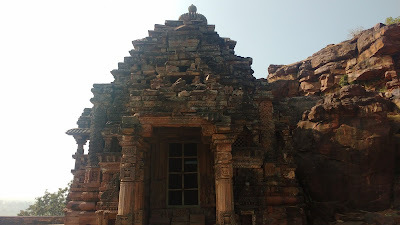 This temple is located just outside the village proper and is accessible from the tehsil office. 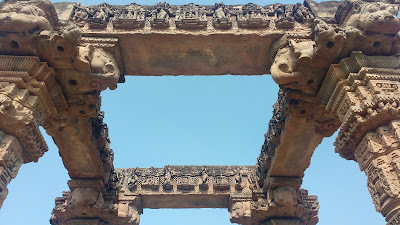 The tenth century temple has three shrines originally meant for Shiva, Vishnu and Surya. 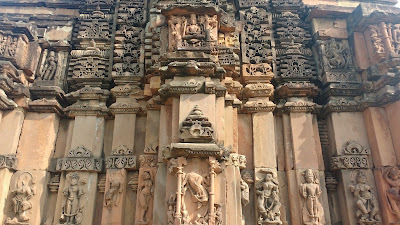 Over a period of time, these idols have been replaced by those of Jain Tirthankars in the later periods. The temple, though now weak, features fantastic artwork on its nagara-style shikhara (spire) and sides. The Shal Bhanjika is iconic in stature. The idol is a poetry in stone with one of the most natural and beautiful of all smiles - done about half a millennia before Leonardo da Vinci's masterpiece with which its smile is often compared. 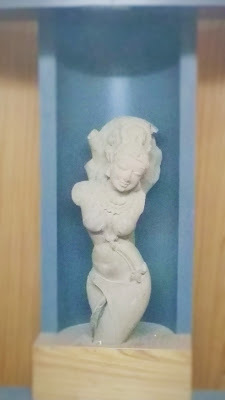 The idol is also known for its hair-style - the ornamental arrangement being a rarity - and is one of the prized possessions of Indian archeology. 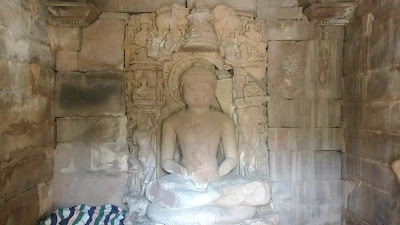 The idol found at Gyaraspur has been subsequently relocated and exhibited at the Gujari Mahal museum in Gwalior. 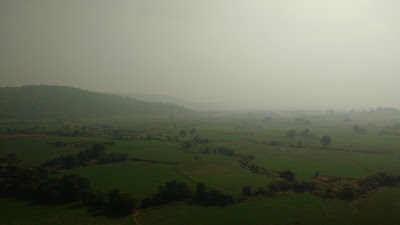 Gyaraspur is located about 100km north-east of Bhopal and 40km north-east of Vidisha on the Bhopal-Sagar highway. The highway passes through the centre of the village. Local buses ply this route every 15-20 minutes. Vidisha is the closest rail head.